Doors open 7.45 for 8.30 start. A welcome return for the brilliantly matched duo of two of the best guitarists around, Pete Oxley and Nicolas Meier. The Observer said of their last album together, The Colors of Time, that “when it comes to empathy, this duet of guitar virtuosi come close to perfection”. 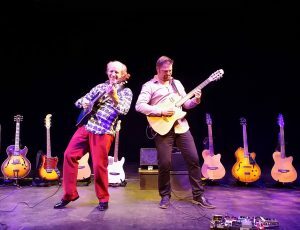 For their live gigs, the Oxley-Meier Guitar Project aim to entertain by playing with a spontaneity and an intuitive interplay between them that keeps them fresh and fired up from gig to gig. So expect the unexpected! Pete began his career in Paris before relocating to London in 1997, since when he’s played with many of the world’s leading jazz artists. Swiss-born Nicolas has performed extensively with his own band as well as spending three years touring the world with Jeff Beck. Henry Lowther formed Still Waters in 1996 along with his friend of 40 years, bassist Dave Green. It is now one of the most accomplished and creative bands around, playing radical and original music, ranging from gentle, quietly pastoral and melodic compositions, reflecting the band’s name, through to dynamic improvisation. In the sixties Henry worked on the rock scene with Manfred Mann and John Mayall, and also with Keef Hartley, with whom he appeared at the legendary Woodstock festival in 1969. Around the same time he joined the John Dankworth Orchestra, an association that was to last 45 years. His musical breadth is confirmed by his frequent appearances as a classical player with major symphony orchestras and ensembles. As a session musician he has recorded with Bing Crosby, George Harrison, Elton John, Paul McCartney, Van Morrison, Sir Simon Rattle and Nelson Riddle. Along with Dave Green on bass, he’s joined by Pete Hurt on saxophone, Barry Green on piano and Paul Clarvis on drums. Alto-sax master Tony Kofi fronts this loving celebration of the jazz giant (in every sense) Julian ‘Cannnonball’ Adderley, which traces the explosive music of Cannonball from his first session as leader in 1955 through work with Miles Davis to the soul-jazz of the late 1960s. 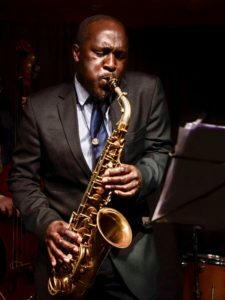 Born of Ghanaian parents, Tony is a British multi-instrumentalist who plays alto, baritone, soprano and tenor saxophones and the flute. He has established himself as a musician, teacher and composer of some authority. 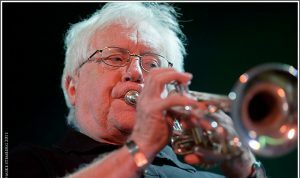 Among many other awards, he was the winner of Best Instrumentalist in the BBC Jazz Awards 2008. As well as leading a number of his own bands, he has worked and recorded with artists such as Ornette Coleman, Courtney Pine, Donald Byrd, Eddie Henderson, The David Murray Big Band, Abdullah Ibrahim, Macy Gray, Harry Connick and the Julian Joseph Big Band. Playing with him this evening will be Jazz Hastings regulars John Donaldson on piano, Simon Thorpe on bass and Spike Wells on drums. 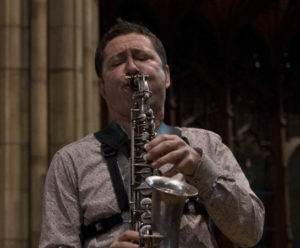 The legendary Bobby Wellins says of Julian Nicholas that: “His beautiful and creative playing makes Julian one of my favourite tenor saxophonists”. After he accompanied her at the Brighton Festival, Nina Simone requested that he play with her again when she came back the following year. Julian was made aware by his composer grandfather that music can be accessible and yet still retain integrity, originality and depth. With this in mind, he has worked in most genres as a session musician and sideman, sustaining a reputation for his own artistry and unique flavour within jazz. Among the artists he has worked with during his career are Jimmy Witherspoon, Bobby Wellins, Martha Reeves, Loose Tubes, Harry ‘Sweets’ Eddison, Stan Tracey and Toyah Wilcox. He says the line-up of his current band – Imogen Ryall on vocals, Mark Edwards on piano, Tim Robertson on bass and Darren A, Beckett on drums – is perfect for the cross-genre melodies and grooves long associated with his style.